The owner of this car bought it as a wreck from Leeds. It is a very rare right-hand drive version, which made the sourcing of parts particularly difficult. CSR restored the car and upgraded many parts while preparing it for racing. Fully converted engine to race spec. CSR continued to develop the car while it was raced in the UK. The car is now raced regularly in New Zealand. 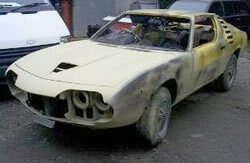 Early in 2001 a New Zealander asked us to convert his UK sourced Montreal for historic racing. Enquiries found no available past experience of these rare cars being raced so we started with a clean sheet. Having collected the car we found it was sound and had survived the years quite well. We were ready to start work. The rusted boot floor was removed and a new floor frame welded in then covered in aluminium with the aluminium race fuel tank underneath. Next the safety cage was welded in and the bodyshell scraped to remove the sound deadening coating before seam welding it. 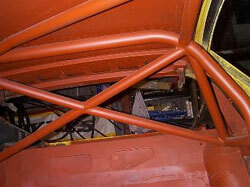 The heavy dashboard was removed and replaced with an alloy frame to which was tied the rollcage for extra stiffness. The owner then came in for a seat fitting and to check he could see and reach all controls and a removable steering wheel was fitted for ease of acces and comfort. Next we had to ensure the car would stop effectively and fitted large Brembo 4 pot calipers and discs to the front – as fitted to the Porsche RSR. The rears were left standard. New stronger lower arms were fabricated for an otherwise standard rear axle. Next job was the engine and as the old one was rused we needed some new parts for a rebuild. Initially it was put together with used parts prior to sorting out the fuel system. New timing chains and a new electric water pump were put in as the standard one is unreliable. The heads were also rebuilt and refaced. We then installed the electronic ignition system with throttle bodies, high pressure fuel pump, Omex filter and fully re-mappable system. When it was finished we started the car first push of the button and took it to the rolling road to find we immediately had 180bhp and more to come. At last we drove the car but the old clutch quickly broke and with it a selector in the gearbox so this was replaced and the car then went very well. 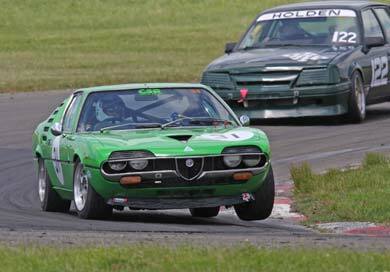 It has since been raced in the UK several times before its journey to New Zealand where it is now racing regularly. Almost 4000 Montreals were produced from 1970 to 1977. A 2+2 coupé, powered by 90° V8, with competition features including dry-sump lubrication and SPICA fuel injection and includes double wishbone front suspension with a live axle in the rear.